If you’re unaware of what this mystery barge is, you can see a picture of it below. It’s been the source of quite a lot of speculation recently with the most commonly touted suggestion of the barges being off shore data centres. 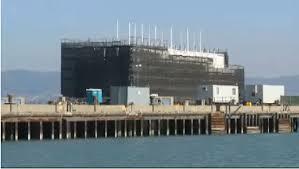 The suggestion of off shore data centres raised quite a lot of concern with a few people suggesting that Google could use these data centres to escape US Law. As the barges were moveable, they could be floated into international waters and therefore a law unto themselves. Rather than answer most questions it does seem to have prompted more. Especially with the incredibly vague “interactive space”. And just what is this new technology? Is it somewhere where people can go and test a Google Car or Google Glass?